HTC phones mysteriously running 10 mins fast? Has the Taiwanese firm perfected time travel? HTC finding a time warp? "It has come to our attention that certain HTC handsets appear to be showing the wrong time, we'd like to reassure you that we are currently working to rectify this and will have an update for you shortly. "We apologise for any inconvenience this may be causing." Here's an odd one for Friday - it seems HTC phones on Android have started running 10 minutes fast over the last 24 hours. 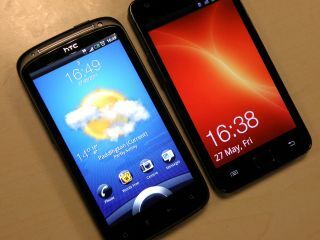 We first noticed it on our device while we were writing our HTC Sensation review, but now it appears scores of users are reporting the same thing. The problem appears if users are running network-based time in the settings, but the odd thing is users across ALL the UK networks are reporting the same thing. We're even seeing the same thing in Spain, although some users are reporting that jumping onto a Wi-Fi network will sort things out back to normal - could it be it's actually an HTC time server for its Sense UI that's messing things up. There are a number of far-fetched 'fixes' already floating around on the forums - from Facebook correcting things to simply turning the phone off, but nothing we've tried on our Sensation or Desire has made a difference. We're going to plug away at HTC for an answer on this one - but it's so odd that we're betting it's going to take a while to get an answer.